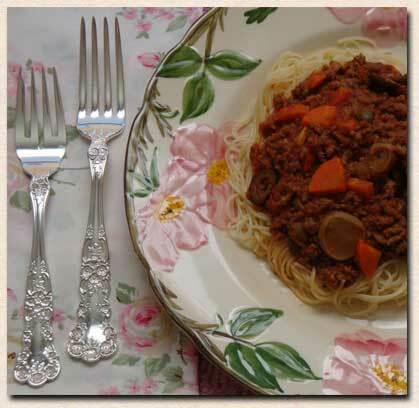 hen I was a child, my mother would make home-made spaghetti for my two brothers and myself. Later, when I was living out in the wide world, she gave me the recipe. It was very basic and easy, in those early years. After trying several other spaghetti recipes and carefully reading ingredients on the bottles of commercial spaghetti sauces, I have created my own special sauce. This recipe has evolved over the course of forty years and it is only a shadow of its former self. Just as life changes with the seasons and the years, so this sauce recipe has been enriched and expanded. Please feel free to make it your own by changing it to suit your purposes. May you indulge and enjoy! If this is too bland, add ¼ to ½ teaspoon red pepper flakes. Simmer on low heat for 2 hours. Serve over your choice of pasta. The flavor improves after freezing. For printable copy, please click here.